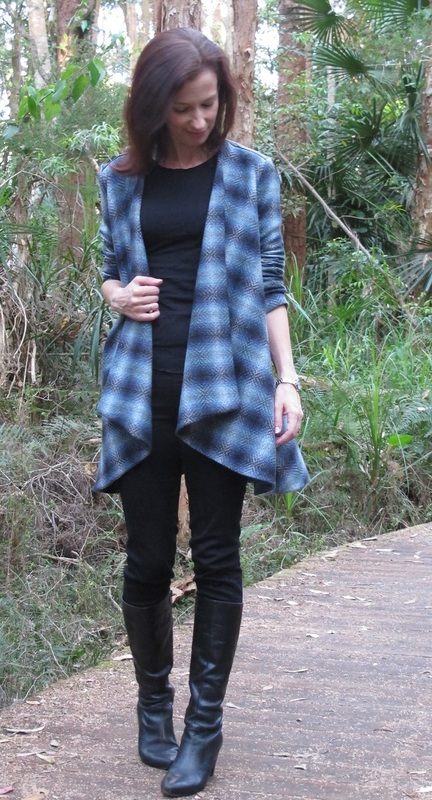 Yes I’m a crazy Australian sewing a wool jacket in spring… it’s for my ‘cold-break’ summer holiday in January. It’s one of those fabrics when you see it – you just need to own it. Well, that’s how it was for me anyway. My Mood Fabric Make that I’ve nicknamed the Coat of Many Bloggers – in honour of the amazing community of people that searched for the pattern, encouraged me and helped me translate the pattern! I loved this Italian Carolina Herrera Black/White/Blended Blue Plaid Suiting from Mood Fabrics as soon as I saw it. I’m a complete sucker for anything blue. 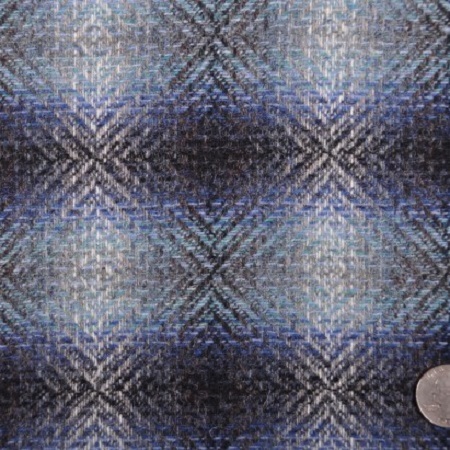 I adored how the weave of this plaid produces almost a holographic look and graduates softly between black/white/blue. It’s not a harsh plaid with solid lines. It is lovely to sew with and not too heavy to cut – this wasn’t the type of fabric where my hands ached after a cutting session. It is a medium weight and could be used to sew a wide range of garments, it would make a lovely suit. It ironed easily and well. Took a hefty whack of steam and never complained. Wool does like to stretch I discovered. So handle with care and consider stabilising your seams or stay stitching. 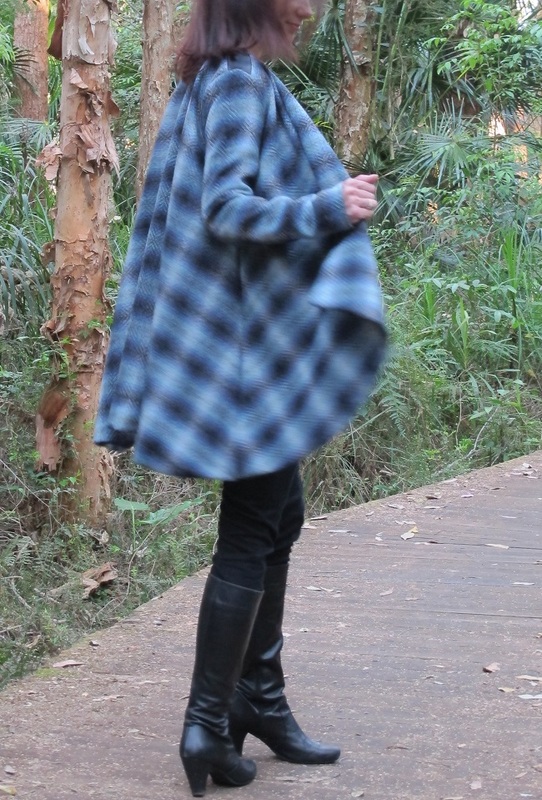 I had originally intended to sew a more traditional coat but keep coming back to the idea of a waterfall/draped long-line loose jacket. I’ve always found it best to go with the heart when you sew. If you look at a fabric and immediately imagine it made up as a certain item of clothing… then go with that. The only problem was most draped jacket patterns seemed to be designed for knit fabrics. Then low-and-behold French designer Vanessa Pouzet released a new jacket design called Eagle. This pattern is in French, it has diagrams but they don’t convey the full construction process – and no I can’t speak French. Google Translate provided limited meaningful assistance. The construction is slightly unusual. I haven’t sewn too many jackets but I have never sewn a lined jacket with this order of construction. However I’m not here to talk about the pattern, there will be more about that on my blog soon about that! Strangely I like plaids, checks and ginghams if they are slightly messed up when sewn up. I like the juxtaposition of the order of the fabric pattern set with a design which throws out the regularity of the fabric print/weave. This is completely a rather odd personal preference – I think I like a bit of chaos. 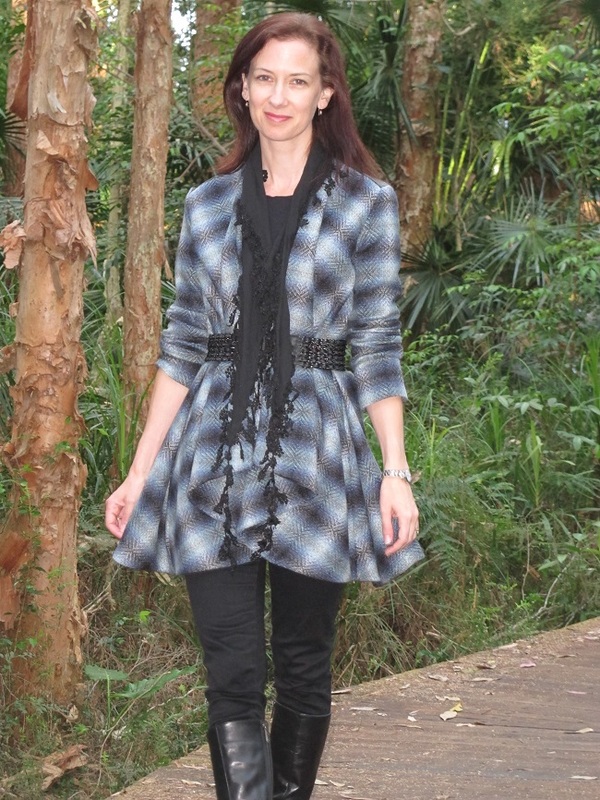 If you are nervous about plaids and all that pattern matching. Don’t be. 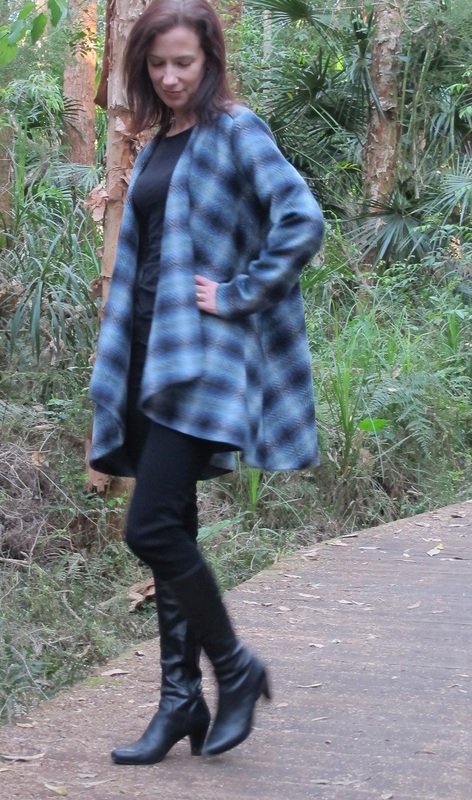 Look for simple patterns or patterns where you can play with the plaid rather than be hemmed in by its rigid nature. The Eagle Jacket – side view. When you move the fabric seems to play tricks on your eyes. It’s quite unusual. While this pattern may be draped, there was still some plaid matching to be done. To match the plaid, I decided to cut the pieces out flat rather than on the fold. I created a full pattern piece for the back and two of the front piece so I could laying them flat and double check that all the plaid would intersect correctly at the side and front seams. To match the sleeves, I cut these out last – after I had constructed the body of the jacket. I often work that way with pattern matching if I know I have plenty of fabric to play with – I cut out a piece at a time as I sew. I put the sleeveless jacket on my dressmaking form, held the paper pattern pieces up to the armhole and marked where the black plaids on the armhole were meeting the sleeve and marked this on the pattern piece. I then laid the marked pattern pieces on the fabric, matching up the plaid and the pattern marks and then cut out the sleeves. Due to the leather shoulder pieces it was impossible to match the back and the front. So I elected the match the front piece and front sleeve. The shoulder features are leather – cut from a piece gifted to me by my lovely friend Susan from her stash. The shoulders also mean that there are a few less seams to pattern match. You can focus on matching the side seams and the fronts. This fabric has enough drape to fall into a single fold when left unbelted. I think the full flare of this coat unbelted, it’s massive and swingy – perhaps swamping me a little but I love coats and tops that billow about. There is something fun and dramatic as they swing around your legs and body as you walk (particularly if you walk as fast as I do!). Wearing it unbelted, the jacket fronts hang with a single fold, when I belted it I folded them back to get a ‘plaid origami’ look. I also love how it transforms from a freeform coat into quite a soft feminine shape with a belt. 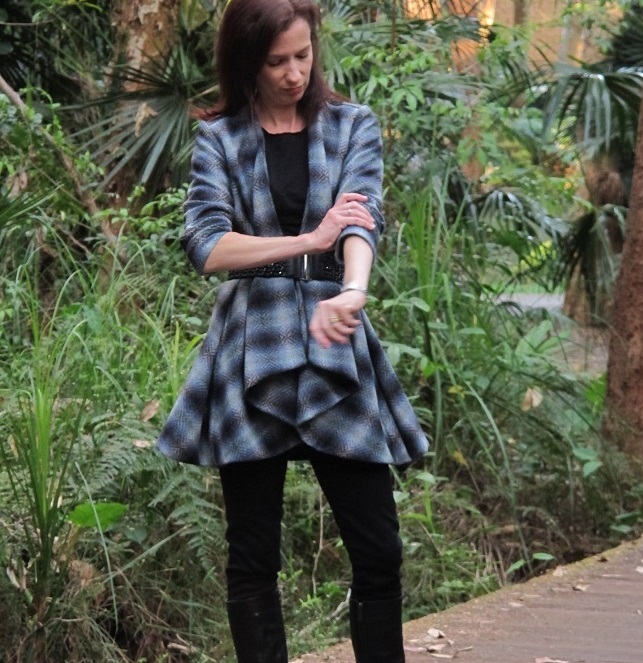 I also love how the plaid meets and moves away from itself in the folds of the jacket. I’m rather pleased how the fabric and pattern came together with this make – I confess I was terrified of disaster but decided to go with my heart and give it a try anyway. Sometimes a bit of bravery and a lot of faith goes a long way when you sew. I can’t help myself – I always push up my sleeves unless it is bitterly cold. And now I have a big snuggly jacket for my cold climate summer holiday!